Seeking out sun, surf, and sand is an easy enough task, but is it possible to stir seclusion into the mix, too? Our editors say “shore”! We’ve dug deep into our arsenal of secret sands to present our top picks for secluded U.S. beaches, where quiet coasts invite in-the-know sunbathers to savor their relative solitude. Sure, some of these destinations are fairly remote (some even require off-the-path travel to offshore islets), but some of the most isolated shores are right under beachgoers’ noses, in popular stateside spots like Florida, California, and Hawaii. You’ll just have to plan a visit soon – while these semi-private sands remain undiscovered for the moment, the cat’s officially out of the bag. Living as long as 2,000 years and growing as high as 35 stories, the imposing old-growth redwoods that make up Northern California’s Redwoods National Park tend to overshadow the region’s sublimely secluded U.S. beaches and coastline, which are separated from the lush forest by wide swaths of sand and marsh. That doesn’t bother the birds and occasional sunbathers at Enderts Beach, an idyllic stretch surrounded by wildflower-carpeted bluffs. 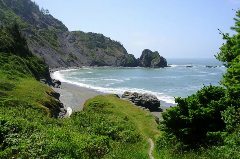 The half-mile walk from the parking lot, about 500 feet above sea level, down to the driftwood-strewn beach is rewarded with bracing breezes and dramatic views of the Pacific and its denizens (migrating whales can be spotted in March and April), with nary a human in sight. Once you hit the sand, send the kids off on a ranger-guided tide pool walk or pitch a tent at the Nickel Creek campground and spend the night in this land of giants. 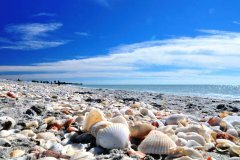 The secret's out about the beauty of Sanibel Island’s linen-white sand beaches – situated about 25 miles southwest of Fort Myers, Florida – so you won’t be alone in searching for a stretch of a secluded U.S. beach to call your own. But that’s just what you’ll get when you leave your car and make the quarter-mile walk to Bowman’s Beach, Sanibel’s most peaceful place. 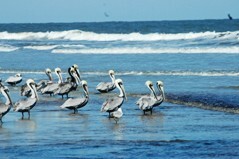 The island is well-known as one of the best shelling spots in the country, but you’ll find little competition here. There’s minimal development and ditto on amenities – though Bowman’s does have one perk not found on any other beach on Sanibel: barbecue grills. Editors' Note: As of press time, the Sanibel Island and Captiva Island Chamber of Commerce note that none of the islands’ beaches have been affected by the Deepwater Horizon oil spill. Find the latest updates on the chamber’s website. Carova Beach, North Carolina This barrier beach covers the upper stretches of the Outer Banks, North Carolina, and is the most undeveloped of an already spartan beach chain. Part of what keeps the region mellow is the lack of paved roads, with Highway 12 stopping north of Corolla. Four-wheel drive is a must, as the only route to these secluded U.S. beaches is a ride on the sand or a primitive system of dirt roads connecting vacation homes in the wooded interior. 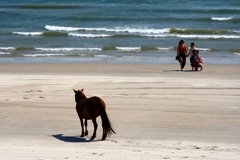 Drive slowly to see the wild horses (some are descendants of shipwrecked Spanish mustangs) that roam the protected dunes. This protected National Seashore in Georgia (it's also designated a United Nations International Biosphere Reserve) has been an in-demand getaway and secluded U.S. beach since the late 19th century, when the Carnegies used it as a family retreat. In the 1970s, the civic-minded family fought to protect the powder-smooth sand from high-rise developments, making it possible for beachcombers to enjoy the wild horses, armadillos, and sea turtles that call the island home. 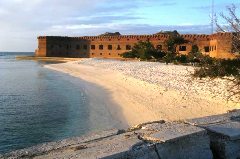 These days, the National Park Service limits the number of day visitors and campers to just 300 per day, but if you stay at the luxurious Greyfield Inn – built in 1900 by the Carnegies, and the island's only hotel – you’ll get unlimited access to a 1,000-foot-wide band of sand that stretches for miles.